The highest performing hifi racks I've personally used were Alvin Lloyd's Grand Prix Audio Monaco. Stephæn and Paul on staff continue to enjoy theirs. The reason mine moved into my friend Dan's system had nothing to do with finding better. I literally downsized. When my wife and I relocated from Cyprus to Switzerland, the new room's layout enforced a sidewall placement of the electronics. While that's far better for sensitive gear and soundstaging than between the speakers, my two Monacos were too deep and tall. They would have obscured the right speaker. I needed something physically more compact. Thus it was that I moved from GPA's multiple degrees of freedom, carbon fiber and weight-rated Sorbothane dampers to a rigid high-mass design on the other side of that divide. Enter different hardwood species from Franck Tchang of acoustic resonator fame. Where Alvin's hi-tech racks had been broad-band resonance attenuators scientifically engineered with accelerometers to quantify and optimize attenuation percentages and effective frequency bands, Franck's wood-shop creation was tuned by ear. It's conceptually closer to a harmonic resonance device. Some vibrational activity is suppressed, some is deliberately enhanced. The goal is making music sound subjectively more beautiful, not necessarily more accurate. You'd probably be correct thinking that in strict audiophile terms I'd made a slip rather than sideways or forward move. Except I never performed a direct comparison. I told myself ignorance is bliss. Mmmmm! Then the pesky mosquito began buzzing. There was an email. 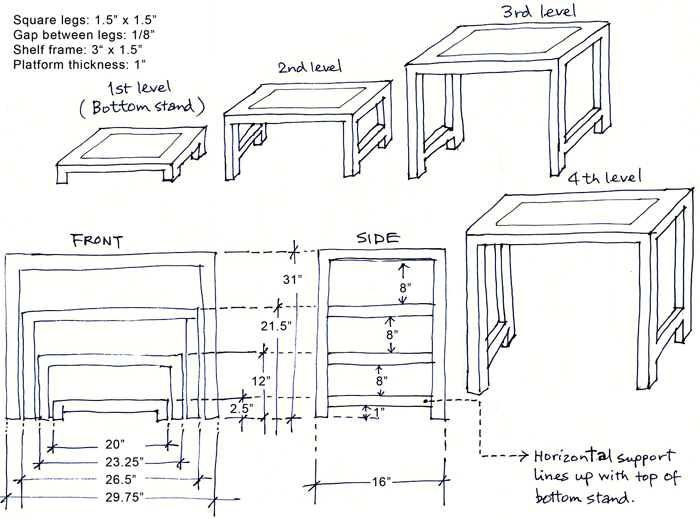 When Daniel Lee of Mark+Daniel contacted me to solicit a review for his new equipment rack, I immediately recognized the basic design. David Kan on staff has used one just like it for more than 10 years. His was the result of a custom commission with a local shop. David of course accompanies all his reviews with many photos of his various domestic installations. Hence his cleverly nested design had been spotted by others. Some liked what they saw enough to want it for themselves. Word migrated across the globe. Someone in Shanghai took note. David kindly agreed to let Daniel copy his design to produce a commercial variant. Even though no formal licensing or monies were involved, David didn't feel like writing up the Arch-3 or Arch-4 himself. Time for the boss to take one for the team. Basics first. Based on M+D's signature compound marble which forms all their speaker enclosures—fine marble dust suspended in resin—the frames are white, the inset shelves speckled white or grey. Spacing between tiers is 20cm, the gap between uprights is 5mm for complete physical separation. Load capacities range from 50kg for the tallest shelf to 70kg for the lowest. The 3-tier version tops out at 54cm high, the 4-tier at 77cm. Depth remains constant, width of course increases progressively with height. Total weight is 34.6kg and 51.1kg. To raise but not duplicate the resonant frequency of the shelves, they're split 45:55 except for the base tier. The manufacturer calls this scheme shock barrier. As the photos show, floor coupling is via the usual spikes and floor protectors. Expectations. Far more related to Franck's tuned furniture approach than Alvin's laboratory engineering, Daniel's rack diverges from the former on a few counts. His shelves are truly isolated from each other. They're not structurally continuous and stacked. From that you'd suspect greater isolation between the components regardless of what tier they occupy. Whilst hardwood species, ASI uses softer grain-directional material. Mark+Daniel runs a solid uniform synthetic compound. Auto suggestions might expect a soft/hard warm/cold difference in sound. Finally Franck Tchang and Alvin Lloyd don't believe in the spike myth of the mechanical diode where vibrational energy drains to ground like water. Daniel Lee does. Based on specs, photos and propaganda, my brain—admittedly very techno peasant in these matters—regarded the Arches as foremost very attractive modern hifi furniture. While user assembly for more convenient flat-pack shipping was initially under consideration, Daniel Lee ultimately rejected it in favor of a stronger mono-material construction. The racks thus ship fully assembled. Since the above rough draft, certain figures have changed to reduce raw ship weight. The legs now are 1" x 1" and the platforms closer to 3/4". Honesty demands that I admit to being less convinced of serious resonance attenuation performance. After all, hard rigid materials like rail-road tracks, steel girders and concrete floors conduct rather than block vibrational energies very nicely. But I also knew how good the M+D speakers are—I own their flagship Fantasia-S—and that lack of molecular crystals in the artificial stone were good things in the fight against evil vibes. But in the end hands-on experience beats theory to a bloody pulp any day. The gist is to shut up and listen. 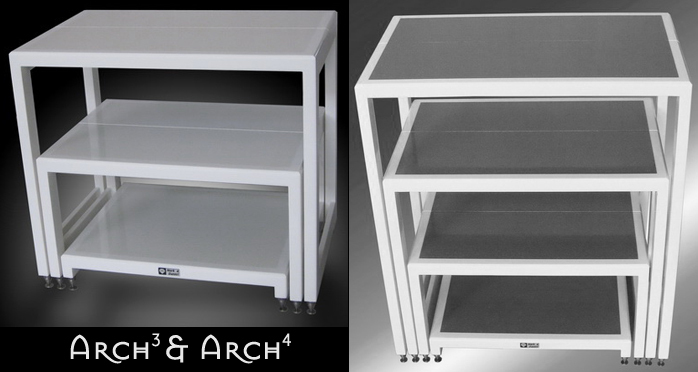 Despite unavoidable living room mess, I signed up for a review loan of two Arch-3 racks and two individual base tiers as amplifier stands. That set would accommodate a wholesale swap for my ASI HeartSong racks. I could A/B to the limits of my tolerance for such fussy exercises. No matter the outcome I thought, I would bloody learn what kind of sonic differences CAM—compound artificial marble—would make to Purple Heart and Golden Heart. Might not this bit of trivia just come in handy some day? I sure liked the modern cosmetics and asked Daniel to dispatch the loaners in all white for the full-on Apple chic.